I created this card using the current sketch over at Freshly Made Sketches for Challenge #53. I recently purchased some really nice SEI papers with copper foil in the patterns. It seemed perfect for the background strips for this sketch. I added sparkle to the digital image as well, but coloring the butterfly with the Sakura sparkly gel pens. I added some additional sparkle around the image with some faux stitched dots. Thanks for visiting today. 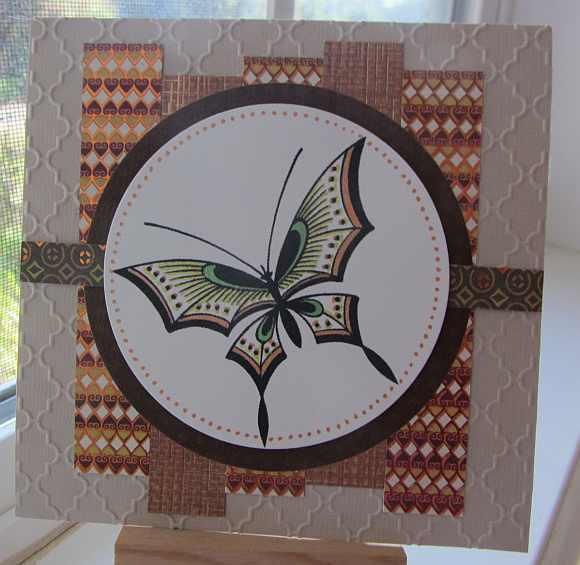 This entry was posted on Sunday, September 23rd, 2012 at 9:56 am	and tagged with butterflies, cardmaking, digital stamps, embossing and posted in Challenges, Freshly Made. You can follow any responses to this entry through the RSS 2.0 feed. Hi Yvonne! Great card! Love the colors and textures you added with embossing and faux stitching. Thanks for joining us this week at Freshly Made Sketches! Really great card! I love the textures, papers and that butterfly is so gorgeous. Great details. Thanks for sharing with us at Freshly Made Sketches this week! Your butterfly is stunning! Thanks for playing with us at Freshly Made Sketches!